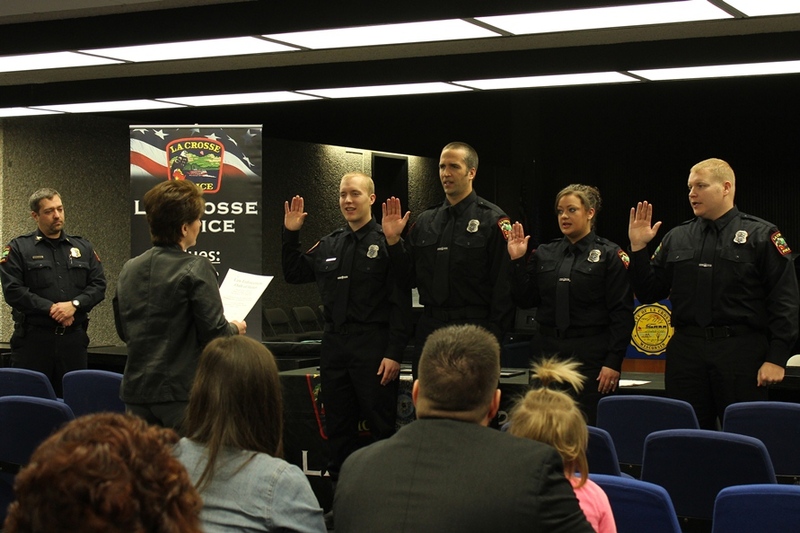 Chief Tischer and the La Crosse Police Department welcomed four new officers at a swearing-in ceremony that took place this morning in the Council Chambers. Joshua Rollins, Whitney Hughes, Dennis Love, and Cody Plenge all joined the LCPD family. Chief Tischer also had the pleasure of assigning Officer James Mancuso to the position of Investigator of Police. L-R: Chief Ron Tischer, City Clerk Teri Lehrke, and new Officers Cody Plenge, Joshua Rollins, Whitney Huges, and Dennis Love.